Jacqueline Dreager's work for Wardlow Station, Great Gathering Place, takes its title from Puvunga, the Chumash name for this area. Known as a meeting place even before the first European settlers arrived, the area continues to be worthy of its earliest name. Historically, the neighborhood has been one where families settled to make homes and futures for themselves. Today, the community is still characterized by many single-family homes—places where the California dream is still being realized. 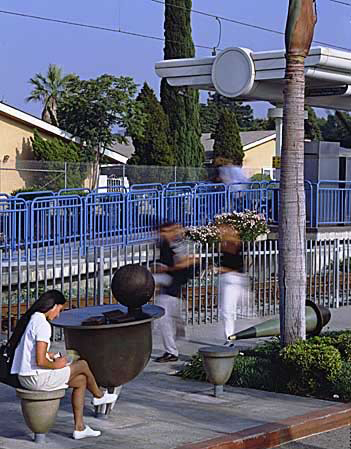 Set at the station entrance, the component “Universial Sundial” was inspired by the Jotham Bixby sundial at nearby Rancho Los Cerritos. A symbol for Dreager of the quiet and serenity of her own home and garden, the sundial is also a reminder of our place on the planet and in the solar system. For Dreager, as for many, home is the center of the universe. 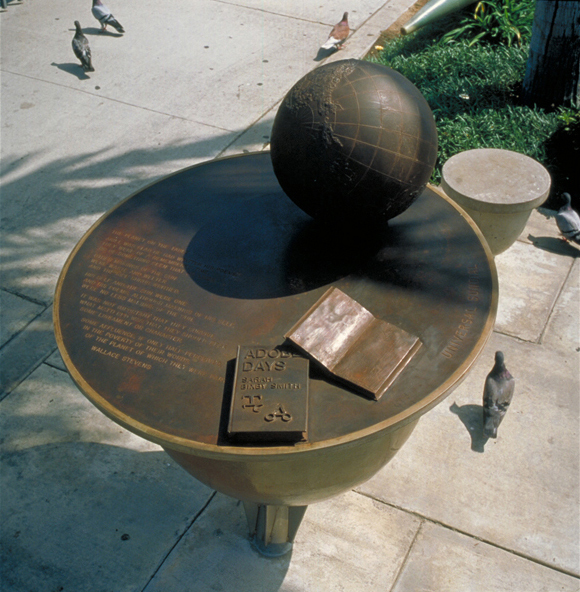 The sundial installation also includes a Wallace Stevens poem, "Planet on the Table." Stools around the sundial were formed in cast-concrete from an old aircraft nosecone found in a local salvage yard, and are a reference to the area's first flying field. Continuing the cosmic motif, an etched glass disk has been installed in one of the station pylons with an image of Saturn, as seen from the Explorer spacecraft. "I believe that my work is some of the most abstract on the entire Blue (B) Line. There are many associations that can be made in my work...planets, seed pods, capsules or just formal structures. It was a challenge to bridge the gap between studio and station." JACQUELINE DREAGER was born in Los Angeles, and grew up in Malibu,CA. When she was ten years old she would ride her bike to Muscle Beach. Her father was a special effects expert so her early years were never dull. She spent a lot of time making things with her father in the garage and using all types of materials; this had a major effect on her. She studied locally at the Otis Art Institute and then at the Institute of Experimental Printmaking in Santa Cruz, CA. She has had solo exhibits in Los Angeles and Chicago. Other public commissions are a sculpture garden for a recycling center in Los Angeles's San Fernando Valley, and as a design team member in planning a pocket park in downtown LA’s South Park area. In 1992 she got a Cultural Affairs grant and in 1990 she worked in the LACE/Homeless Outreach Program as Artist in Residence. She lives in Montecito Heights and works in downtown Los Angeles.